Puddle Jumping Adventure 4" x 4" Collage, originally uploaded by DianthusMoon. When it rains it certainly pours! We are getting way too much rain now. The basement had water in it and it had stopped coming in for a few hours, but it’s back again. We need to get some topsoil and gravel for areas where the water tends to come in around the house. The Brandywine River is going to crest and go 3 feet over it’s banks. The guys made out fine going and coming from work. It was really humid too. 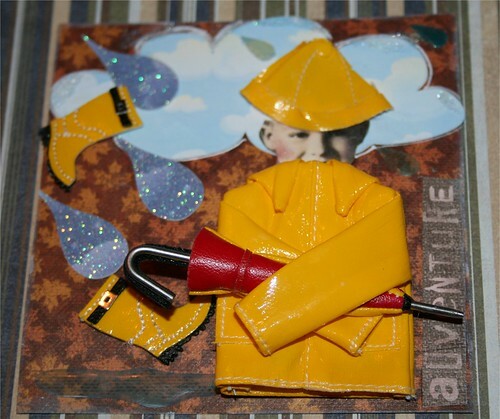 I decided this card had to be about the rain. I had found the rain gear set at Big*Lots a while ago. I surely remember being dressed like that way back in the day. Hoping we don’t wake up to a really wet basement. I’m promoting the upcoming Maryland Home & Garden Show, October 15-17 at the Maryland State Fairgrounds and thought as a domestic goddess with an interest in gardening and crafts you’d be interested in the show and perhaps want to share some information about the show with your readers. The show will feature the latest and greatest for the home and garden, with more than 400 home improvement, landscaping and better living exhibitors, seminars with nationally-known experts and 8 fully landscaped gardens. The show will be packed with latest kitchen appliances, fixtures and countertops, wood flooring and tile, cabinetry, wall and window treatments. And for those with a little less of the DIY mentality, there will be more than 70 professional service providers on hand to help visitors brings their plans to fruition. Once again, Maryland Home & Garden Show will include the Maryland Fall Craft Show with 100 local artisans to help craft lovers furnish their homes with handmade art and one-of-a-kind accessories. The show also features a great opportunity to help out those less fortunate, partnering with Habitat for Humanity of the Chesapeake to raffle off a playhouse inspired by a Habitat residence and built by volunteers. Visitors can also build and paint birdhouses or purchase kits to take home. All proceeds from the raffle and birdhouses benefit Habitat for Humanity of the Chesapeake. If you’d like I can send along the press release, calendar listing and images and tickets if you’d like to attend or give some away to your readers.